Nigeria bounced back from their opening day FIFA U-20 Women’s World Cup Papua New Guinea 2016 defeat by coming from a goal down to record a 3-1 victory over Canada in Port Moresby. Gabrielle Carle had fired the Canucks into the lead at Bava Park on 15 minutes, but an equalising penalty from Chinaza Uchendu just before the break and second-half goals from Joy Bokiri and Chinwendu Ihezuo gave the Falconets their first win of the tournament. Both sides had slipped to heavy losses in their previous Group B clash and were looking to make amends. In an entertaining first half, Nigeria tested Canada early on when Ihezuo shot narrowly over the bar on 10 minutes. The Canadians took the lead five minutes later when Deanne Rose received a long ball inside the box and played a neat pass to Carle, and the No10 made no mistake from close range. Nigeria came close to capitalising on a mistake on 37 minutes when Hannah Taylor lost control of the ball in her box, allowing Rasheedat Ajibade – a veteran of the U-17 Women’s World Cup Jordan 2016 – time to pounce, but her effort was blocked by Rylee Foster. 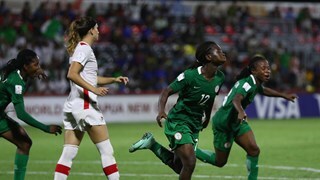 The Falconets eventually restored parity just before half-time when Canada’s Bianca St Georges was penalised for handling the ball inside the area, with Uchendu stepping up and converting the spot-kick. With a spring in their step going into the break, Nigeria made an instant impact in the second half with Bokiri putting the African side into the lead immediately after the restart. Peter Dedevbo's side then doubled their advantage on 73 minutes when Ihezuo capitalised on a mistake by goalkeeper Foster and was left with an easy finish in front of an empty goal. Nigeria next face top-of-the-table Spain in Group B, while Canada next meet Japan on 20 November.